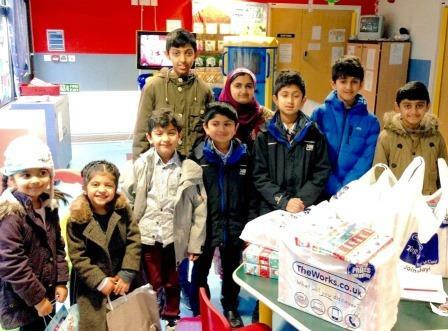 Muslim kids spread some Christmas cheer to sick children at Airedale Hospital on Saturday. The youngsters gave out presents of toys, sweets and festive cards to 24 poorly patients on the children’s ward.Many parents were reduced to tears by the generous and touching gesture from the Muslim boys and girls at Christmas time.The mini Santas from Keighley’s Ahmadiyya Muslim Youth Association (AMYA) gave up the first day of their Yuletide school holidays to spread festive cheer to the young patients of Airedale Hospital’s Children Ward.Christmas presents for the ill children had been generously donated by members of the Ahmadiyya Muslim Community, and included toys, chocolate and seasonal greetings cards. Share the post "Parents of Poorly Children in Airedale Hospital Weep at the Kindness of Muslim Kids at Christmas"